Funko is filing a lawsuit against Loot Crate, and it all comes down to branding. ComicBook.com has learned from a source close to the issue that Funko will be filing a lawsuit tonight against the monthly subscription box service Loot Crate. This could come as a surprise to some readers as the company has long offered Funko products in its comics, video games, and movie boxes. UPDATE: Funko has filed a lawsuit against Loot Crate in the United States District Court, Western District of Washington at Seattle. The suit cites complaints including trademark infringement, false designation of origin, and unfair competition. The issue stems from how Loot Crate uses Funko’s branding in its advertising. Loot Crate can include Funko items in its products, but evidently, it has been using Funko’s logo and imagery in advertising to an extent that the popular collectible company has decided to take action. The source said that Funko has reached out to Loot Crate multiple times about the matter, but hasn’t received any response, so now it is taking the issue to court. An example of this is in the newest Gaming Treasure Loot Crate, which features company logos and pictures of some of the possible items inside. 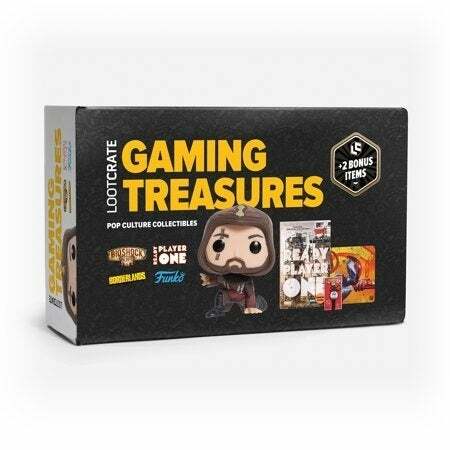 The box features several logos (including Funko’s) and a large image of an Assassin’s Creed POP, which Funko sees as Loot Crate using its brand to sell its items, as opposed to just a listing that a Funko POP is included. You can see an image of the Loot Crate in question above. Loot Crates typically have a Funko item (most often a POP) as part of their boxes, which also include things like t-shirts, hats, pins, and other random items delivered to subscribers every month or every few months, and retail for around $19.99. Our source indicates that Loot Crate hasn’t responded to Funko’s requests about the matter, but we’ll keep you updated on the situation as it develops. Funko has skyrocketed in recent years, in great part due to the popularity of their Funko POP line of vinyl collectibles. Since then they’ve also introduced new lines like Five Star, VYNL, Dorpbz, Pint Sized Heroes, Mystery Minis, and more, but the POP line continues to thrive with new licenses every month and shows no signs of stopping anytime soon. So what does this mean for Funko and Loot Crate in the future? We will find out in due time. Funko – Toy Fair New York Reveals: Pet Sematary Pop!